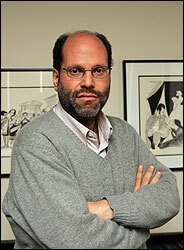 Novels, plays and re-makes — Scott Rudin does them all and very well1. Disney, lately, doesn’t. With Eisner out, the new head of Disney could look like a genius simply by leaning back and letting Rudy do his thing. I wonder if they’ll let him produce some of the animated fare that is Disney’s bread and butter… Imagine it now, The Hours in glorious cell-shaded 3D! 1. He can’t be blamed for the disastrous Stepford Wives remake — it was a poisoned set due to Walken and Kidman’s egos (I hear tell).